Ravioli in soup? Trust us, it works. Roasting the tomatoes enhances their sweetness and adds a beautiful depth to the soup, and butter beans give the soup a lovely, creamy texture without having to add any dairy. Even non-vegans will want a taste of this. 1. Preheat the oven to 200°C, gas mark 6. Put the tomatoes, along with any vines (for extra flavour), in a large roasting tray. Add the leeks, garlic and thyme; drizzle over the olive oil and season. Roast for 25 minutes, then add the butter beans, stock and 250ml water to the tray; return to the oven for another 15 minutes. Set aside to cool for 10 minutes. 2. Remove and discard any woody thyme sprigs and tomato vines from the tray, then tip the contents into a large blender with 1 tbsp extra virgin olive oil. Whizz until smooth, loosening with more water if needed and adjusting the seasoning (you may need to add a pinch of sugar or honey, too). 3. Cook the ravioli according to pack instructions, then drain and toss with the remaining 1 tbsp extra virgin olive oil. Reheat the soup if necessary and divide between bowls. Top each bowl with a few ravioli and basil leaves. 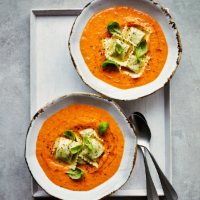 This recipe appeared within the March 2019 recipe card collection. This recipe was first published in Thu Feb 28 12:21:15 GMT 2019.